This Easter Card doesn't have any stamping except for the sentiment on the inside. It is done primarily with lots of layers. The card is made using all Neenah Cream Card stock which gives it an elegant look. The base of the card is a 6x5.5. Another piece of card stock was cut at 5.5x5 allowing for a 1/4 inch on all sides. I used an 18 kt. Krylon Gold Leafing Pen along all the edges of the different layers to enhance the elegance. The corners were punched with SU Ticket Punch. The next layers was a 5x5 and the Martha Stewart Double Loop Corner and Border Punches were used to created the nice border all the around the piece of paper. Next I cut a piece of paper 4 inch square, used the Krylon Pen and SU Ticket Punch on it. The next piece is 3.75 square and I did the exact same thing. Using Spellbinders new Lotus Pendant, a piece was cut and then embossed with the Cuttlebug Swiss Dots and the Krylon Pen were used on the outer edges. 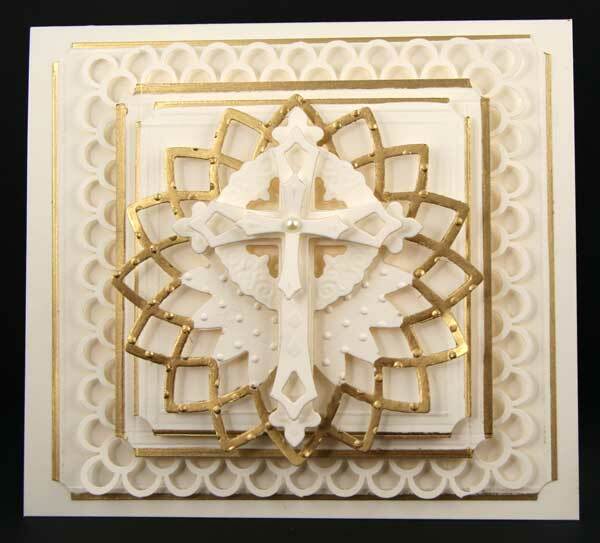 The next step was to cut all 3 Crosses from Spellbinders newest Cross Die Set. Every layer was popped up with the Therm-O-Web Dimensionals and a Kaiser Champaign Pearl was added to the center. not completely original, but I changed many things which made it my own. I hope each of you enjoy the celebration of the resurrection of Christ. What a day to rejoice! Very, very gorgeous Joan. Love all the layers and the gold makes it so beautiful. This is absolutely STUNNING Joan!! Joan, this is so beautiful. I love all those gorgeous layers. This is gorgeous! So elegant perfect for the celebration of the resurrection of Christ. Have a blessed Easter Joan! Oh, Joan what a beautiful card. I used the Cross Collection to make Easter cards for the residents in nursing homes who are on our prayer circle list. I know they will love them. That collection may just be my favorite. Joan How are YOU!!!??? This is such a pretty card... Wishing you a wonderful and blessed Easter... I will be enjoying my family... Hopefully I will get some pics posted after the weekend. Oh my.....this card is absoultely stunning. Now I'm a tad sorry that I did not order the cross dies. This is beautiful Joan! 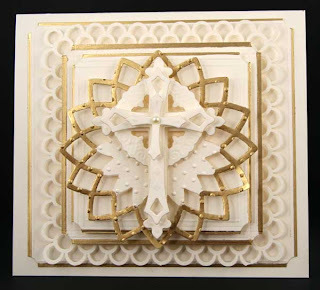 the layered cross looks wonderful! WOWZERS!!!! This is just breath taking..beyond beautiful! Wow, Joan, this is gorgeous!!! Just stunning, Joan. Happy Easter!